When I got into networking there was only one type of ping I was familiar with: ping. After being in networking for awhile and working with different groups I’ve come to encounter a few other varieties of ping-like tools that are used to perform basic troubleshooting for different applications. Here’s a high level look at some of the more popular ones I have encountered. Ping is probably the most common and well known tool for troubleshooting reachability of a host. Ping usually uses ICMP (although it can be set to use UDP or TCP on operating system). It sends an echo packet to the destination and waits for the echo-reply packet to be sent back. With it’s default settings ping is able to show you if a host is active, the round trip time, TTL, and any packet loss. Using other options you can also use it to troubleshoot fragmentation issues, MTU issues, or determine the return path (record option). Ping comes standard on every operating system as well as all networking hardware. For more info on the version of ping included in Cisco IOS check out this page. TNSPing is a utility created by Oracle to determine if an Oracle service can be successfully reached over the network. It only confirms if the listener is up and will not give you any indication of the state of the database itself. For more information on TNSPing check out this link from Oracle. Niping works similarly to a iperf/ttcp test in that it requires a client and server version of the tool to run. Like TNSPing, Niping runs tests on a higher level than ICMP does. Niping is useful to see if the required ports for SAP are open on a firewall if telnet isn’t available. For more information on NiPing check out this link. One of the lesser used functions of Wireshark is it’s ability to graph different data. 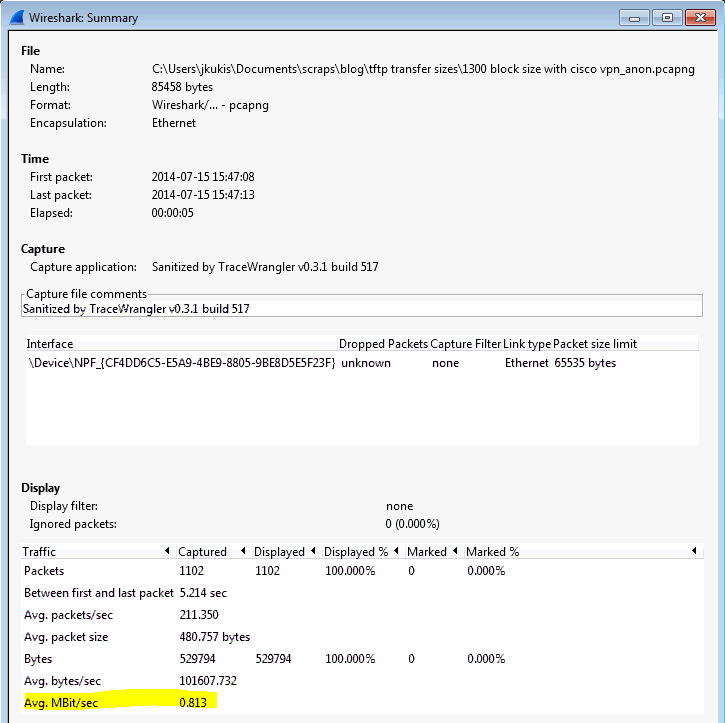 When troubleshooting a problem using a packet capture the amount of data can be overwhelming. Scrolling through hundreds or thousands of packets trying to follow a conversation or find a problem you don’t know exists can be frustrating. Wireshark comes with a number of built in graphs that help make these issues become much more obvious. In this post I’ll cover IO graphs. 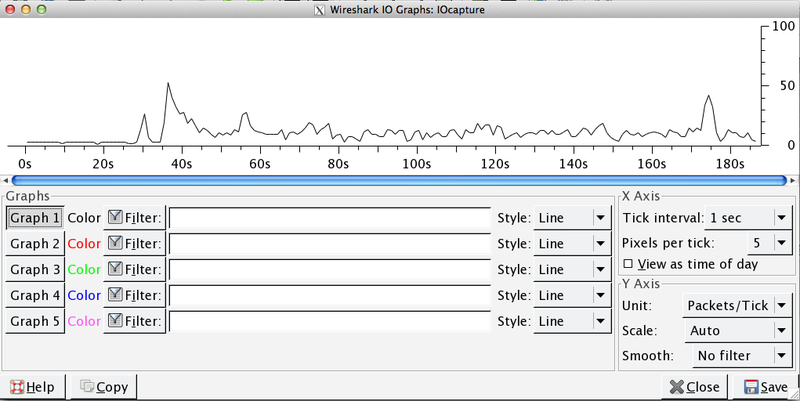 The basic Wireshark IO graph will show you the overall traffic seen in a capture file, usually in a per second rate (either packets or bytes). By default the X axis will set the tick interval to one second, and the Y axis will be packets per tick. If you prefer to see the bytes or bits per second, just click the “Unit:” dropdown under “Y Axis” and select which one you want to look at. Using our example, we can see the overall rate of traffic for all captured traffic. At the most basic level, this can be useful for seeing spikes ( or dips) in your traffic and taking a closer look into that traffic. To look into the traffic closer, just click any point on the graph and it will focus on that packet in the background packet list window. If you want to get a more granular view of the traffic, just click the ‘Tick interval” dropdown under “X-Axis” and select a smaller time interval. Let’s take a look at the basic components of the IO graph window. Graphs – There are 5 different graph buttons, allowing you to graph up to 5 different things at one time. Each Graph button is linked to a different color graph (not changeable). We will go into some further examples using multiple graphs in a little bit. Filters – Each graph can have a filter associated with it. This filter box uses any of the same display filters you would use in the main Wireshark window. Styles – There are four different styles you can use: Line, Impulse, Fbar, and Dots. If you are graphing multiple items, you might want to choose different styles for each graph to make sure everything is visible and one graph doesn’t cover up another. Graph 1 will always be the foreground layer. X and Y Axis – Wireshark will automatically define both axis’ based on traffic being plotted. The default for the x axis is 1 second.The X axis default is usually OK for looking at most traffic, but if you are trying to look at bursty traffic you may need to use a smaller X-Axis tick interval. Pixels per tick allows you to alter the spacing of the ticks on the graph. The default for the y axis is packets per tick. Other options include bytes/tick, bits/tick, or Advanced. We’ll touch on the Advanced features later on. The scale is set to auto by default. To start, open up this sample packet capture, or your own in Wireshark and click on Statistics – IO Graphs. 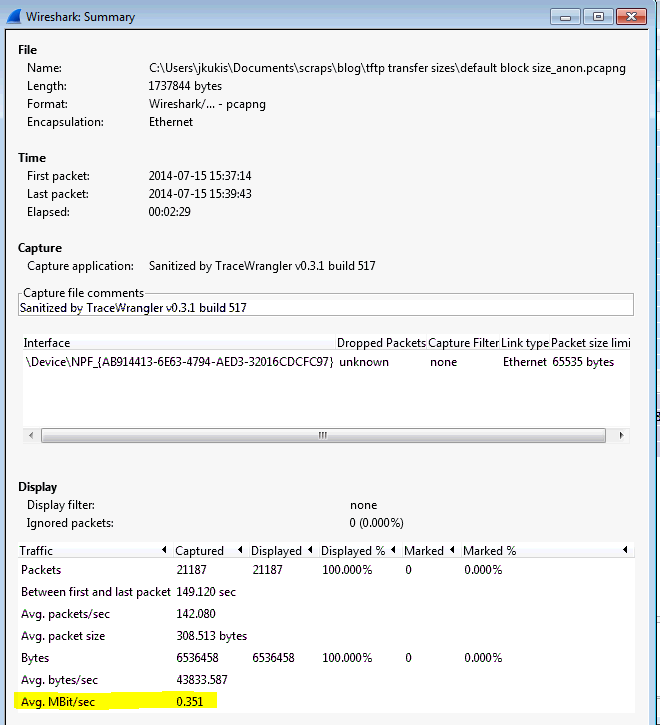 This capture is an HTTP download that encountered packet loss. I also have a constant ping going to the host. Let’s stop for a second and just point out the obvious. The graph is showing all traffic because the filter box is blank. The default view will show us packets per second. 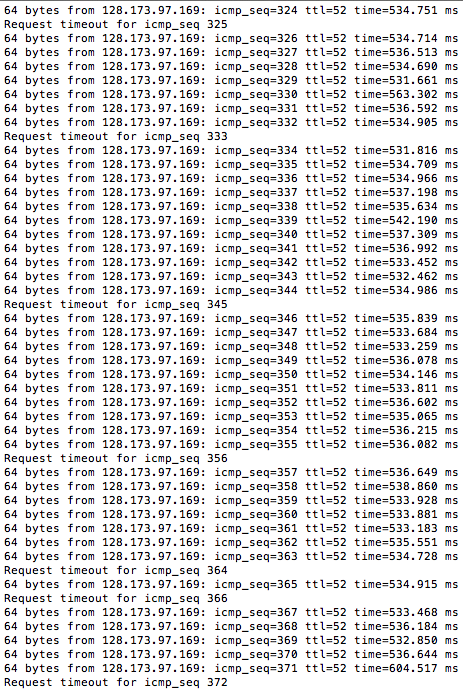 While the default view of packets/second is OK, it’s not super useful for most troubleshooting I’ve run into. Let’s change the Y Axis to bits/tick so we can see a traffic rate in bits per second and get a rate of traffic. We can see that the peak of traffic is somewhere around 300kbps. If you had a capture you were looking at that had places where the traffic rate dropped to zero, that might be a reason to dive further into those time periods and see what is going on. This is a case where it would be very easy to spot on the graph, but might not be as obvious just scrolling through the packet list. Each graph allows you to apply a filter to it. There aren’t really any limitations on what you can filter here. Anything that is a display filter is fair game and can help you with your analysis. Let’s start off with something basic. I’ll create two different graphs, one graphing HTTP traffic and one graphing ICMP. We can see Graph 1(Black Line style) is filtered using ‘http’ and Graph 2(Red Fbar style) is filtered using ‘icmp’. You might notice there are some gaps in the red Fbar lines which are filtered on ICMP traffic. Let’s have a closer look at those. tcp.analysis.window_update – this will graph the size of the TCP window throughout your transfer. If you see this window size drop down to zero(or near zero) during your transfer it means the sender has backed off and is waiting for the receiver to acknowledge all of the data already sent. This would indicate the receiving end is overwhelmed. tcp.analysis.bytes_in_flight – the number of unacknowledged bytes on the wire at a point in time. The number of unacknowledged bytes should never exceed your TCP window size (defined in the initial 3 way TCP handshake) and to maximize your throughput you want to get as close as possible to the TCP window size. If you see a number consistently lower than your TCP window size, it could indicate packet loss or some other issue along the path preventing you from maximizing throughput. From this capture we can see that there are a fairly large number of retransmissions and duplicate ACKs compared to the amount of overall HTTP traffic(black line). Looking at the packet list alone, you may be able to get some idea that there are a number of duplicate acks and retransmissions going on but it’s hard to get a grasp of when they are occurring throughout the capture and in what proportion they occur compared to overall traffic. This graph makes it a little clearer. In the next post I’m going to go into using some of the more advanced features of IO graphs such as functions and comparing multiple captures in one graph. Hope this was helpful to get you started with IO graphs.